So, you just got yourself a cute, cuddly, new kitten (or maybe you'll find one under the Christmas tree?) Congratulations! … now what? Taking your new pet to the vet can be overwhelming for you and your new kitty. As technicians and doctors, we have the job of taking their temperature and looking in their ears and mouths - all the things cats find to be rude and unpleasant! We would think it rude of our doctor to take our temperature without our permission too, but let's talk about all the things we can do as pet owners to reduce stress at the vet, just by playing at home. 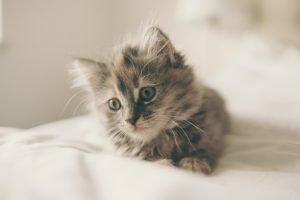 Once your kitten is comfortable with you and vice versa, it is good to start getting them used to handling for exams and treatments. For instance, playing with their paws and nails, to desensitize them to humans touching their feet. This will help reduce the stress of the dreaded nail trims and make paw examinations easier. Make sure you look in their ears on a regular basis. Touching and massaging their ear flaps will make ear cleaning or examinations feel more normal and less scary for them. Also, starting when they are young, make it a routine to look in their mouth at their teeth and gums. This will help you with teeth brushing and keeping an eye on dental disease. It will also help us veterinary professionals do the same. We look in your pets mouths for various reasons. If they are used to it, your vet visit will be less stressful and will be a more fun experience for everyone! We know, cats can be very particular. They like to be touched and pet on their own terms. We totally get that, but if you start them young all of this will be a breeze! 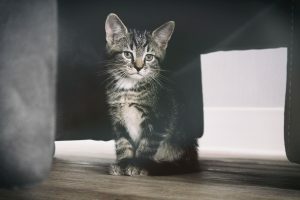 Last but not least, check out our previous blog on Feliway a spray, diffuser or wipe whichwill also help with the stress of vet visits. If you haven't read it yet you can find that here. If you have any worries about bringing your kitten to the vet, please contact your nearest VetnCare hospital and we will be happy to help!